Use this article as a guide to remove string algae from your pond, by using natural solutions, and without chemicals like harsh algaecides. Pond algae control methods will vary based on the type of algae in your pond; to completely remove string algae you WILL be getting your hands dirty! What is String Algae and is it Dangerous? How to Remove String Algae From Your Pond. 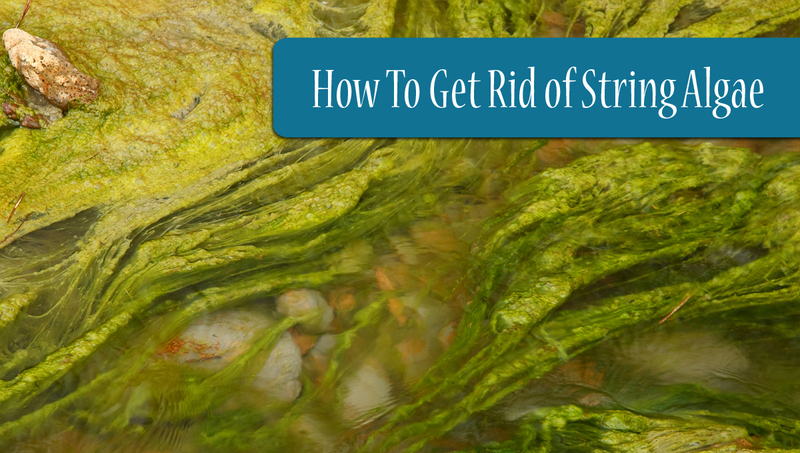 5 Steps for String Algae Removal & Reduction. Can I use an Algaecide to Control Pond Algae? Can I use a UV Light To Combat String Algae? Balance Your Pond with a Natural Solution. HOW TO CONTROL POND ALGAE NATURALLY – While this article specifically mentions string algae removal methods, it is also very relevant for all types of pond algae control. Algae is essential to a healthy pond and this guide will teach you natural methods for keeping your pond balanced. Too much algae can impair the aesthetics of your backyard pond, deplete oxygen, and potentially harm your aquatic life. Discoloration of water may mean that the water quality of the pond is poor, but green water does not always mean unhealthy. Always test water parameters to see how far the water has cycled and choose the appropriate solution. String algae is a filamentous species that attaches to plants, hangs from rocks in waterfalls, or hangs on the surface of the water (which is referred to as Blanket Algae). The long strands tangle together and form thick mats that can double their weight within 24 hours! This unsightly green mess tends to adhere directly to rocks and is not to be confused with the good algae which forms on the side of the pond and is soft, velvety, and jelly-like. Though it may appear ugly, string algae is not a major danger to your fish’s health but it can be to the overall appearance/water clarity of your pond. To stop string algae: You must reduce the nutrients that fuel the algae growth cycle. Excessive string algae will reduce oxygen content, but doesn’t necessarily mean bad water. Believe it or not, it is a sign of beneficial water qualities. Anything over 3″ is considered bad algae, but under that length is acceptable since it contains a beneficial variety of carpet algae which is home to important macro organisms that fully promote a healthy water column. On the other – more dangerous hand, read our article on warning signs for blue green algae in your pond. To remove and reduce string algae you must scoop it out first and then get to the bottom of the issue in your water chemistry if it comes back. String algae removal typically takes 20-70 days when using Nualgi Ponds in combination with beneficial bacteria to speed up the process. We’ve noticed results within 8 days & in extreme cases up to 4 months! Don’t underestimate the value of physical algae removal. 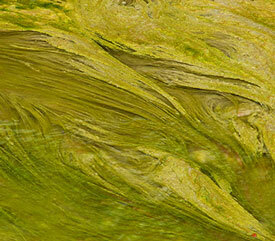 Your waterfall will be the most difficult place to remove algae in your pond. Since the water rushes by so quickly it is difficult for water treatments to do their job effectively. To completely rid your waterfall of string algae it may take up to 2 seasons, so be patient and make sure you are not adding excess nutrients to fuel more algae growth! Read more about the value of choosing the right aerator for your pond. Learn how Nualgi Ponds users combat algae in their backyard ponds. Use Nualgi Ponds To Fight All Types of Algae. Step 1. Physically Remove String Algae – This is your best method for removing string algae. Though it may seem dirty, it is essential to do before treating so you can reduce the amount of decay. Pull the biggest bits of near the base, pull hard, and put it into a bucket. It can sometimes be difficult to pull out a lot at one time since it is soft and malleable. Physical removal is the fastest way to get algae out of your pond and take the next step to crystal clear pond water. Winding around fingers/hands is the best approach aside from a toilet or long lint brush to roll it up with. The hand approach is easier because the thin strands are difficult to clean away from brush bristles. Wearing gloves are not required but may keep you cleaner. Use a long handled brush to pull out the algae at depth. Step 2. Treat Water and Kill Off Remaining Algae – Some sources suggest using a pond algaecide to kill off the remaining algae but we never recommend unnatural chemicals even if the labels state they are safe for fish and plants. We stick to natural solutions for algae control and recommend a combination of Nualgi Ponds with bacteria/enzymes to speed up the process. Normal green hair-like or carpet/blanket algae which grows on pond walls and some rocks is best left untouched and completely acceptable. However, it is possible that Nualgi will eventually eliminate this type of algae. We like to think of our process as out-competing and starving the algae rather than killing it. Step 3. Add Extra Plants and Remove Decay – Place quick growing and reproducing plants in your pond to increase oxygen content. Make sure you take out the decaying plants first, as they will not help your fight against algae. Choose plants that will grow larger, consume a lot of nutrients, and will not require a lot of upkeep. We recommend Water Lettuce, Irises, and Cattails for the spring and summer. Marsh Marigold is one of the earliest plants to sprout in the season and helps to prepare your pond for the spring. A great winter plant is Water Hawthorne which does best in cold months and has the best prices during the summer. Make sure you remove some of your extra plants from time to time to let new growth occur in your pond. You can solve many problems as a pond owner by placing plants to out-compete algae and suspend algae for excess nutrients. Just be careful to not add in any plants that already have algae attached! Step 4. Find the Cause of the Algae Growth – Look for potential causes of string algae by testing your water quality. If algae is growing at a problematic level than it is time to look beyond the algae and mat and deeper into the pond chemistry. High pH and Phosphorous levels are the leading cause of algae blooms. Examples of what can cause high pH are the clearing of algae blooms, excessive plant growth, overstocking of fish, and the introduction of foreign materials (untreated concrete, rocks containing limestone or calcium/granite). The most common cause of high phosphorous is from fertilizers that have leaked into the pond water. Iron is also a major contributor as well as grass clippings that find their way into the pond after mowing the lawn. Scoop green grass blades out immediately. Step 5. Feed Koi & Fish Less to Reduce Excess Nutrients – One of the most common errors by fish pond owners is to overfeed their fish, thus adding excess nutrient to the water. If there is any food left in the pond uneaten, you’ve fed your fish too much. By feeding less you also increase the fishes’ appetite for other substances in the pond. Like algae! Try feeding your fish less this summer and see how fast they will cut through a string algae mess. A few corbicula clams in the pond is an excellent way to keep excess nutrients cleaned up and in check. Each clam filters up to a liter and a half of water per hour. Read other Koi Pond Care Tips for the Summer. String algae can be a nuisance but with patience, a good rake, and Nualgi Ponds you can conquer this ugly mess! The most common algae control method is to add a copper based algaecide to kill visible algae. Though an algaecide may be useful from time to time, you need to apply with care. If you overuse and/or kill algae off too quickly, it can come with its own set of problems from oxygen depletion, including toxic reactions for fish, native plants, and wildlife. Many algaecides also negatively affect the “good” bacteria designed to help keep a pond cleaner. Once these are wiped out, algae can grow more readily and may force a pond owner into a never-ending cycle of chemical use. Algaecides can be effective at controlling what you can see, but this does not address the bigger problem. Killing the algae can also contribute to more and more excess organic matter when it dies. As a result, the algae problem will come back time and again. Use Nualgi Ponds as a natural algaecide alternative and your fish will thank you with more color, activity, and happiness. UV lights do not kill string algae. String algae is attached to different parts of your pond and therefore will not flow past the UV light. Nualgi Ponds eliminates the need for a UV light and we do not recommend using a UV light while using Nualgi Ponds. Barley straw is a great organic product to use, but it doesn’t exactly kill existing algae and instead creates conditions that prevent the new growth of algae. Put it in your pond early as it can potentially create a temporary algae bloom later in the season. Be careful, overdosing the pond with barley straw may cause fish kills, due to the straw de-oxygenating the water as it decays. 2 lbs per 1000 gal of water is the recommended amount to use. In still and small pond waters the dosage of straw should be 50 grams (approximately 2oz.) per square meter of water surface area. When it is applied to cold water (less than 50°F), it may take six to eight weeks for the straw to begin producing the active chemicals that reduce algae. In warmer water above 70F, it becomes effective in as little as two weeks. In any case, barley straw remains effective for approximately six months after it is applied. If the straw starts to smell, it should be removed and replaced. It is an indication that there was too much straw for too little water. If the thought of physically scooping out algae yourself is revolting, than it is time to get creative. Might we suggest you create a story for your children/grand children about the importance of pond algae control. Or maybe you can enlist help from a neighbor who will scoop the scum. Remember to explain safety precautions around the pond and good luck! No matter what you choose to do about the algae in your pond we are happy to help. Please try Nualgi Ponds to balance your pond and greatly reduce algae build up. If you are still having trouble, please submit a request to our pond diagnosis and troubleshooting form so we can get to the bottom of your issue. Bottom line: Remove string algae manually, do not add unnecessary nutrients to pond water, and keep a close look on the water quality parameters. If the problematic algae continues to return it is a cause of a greater issue within your water and should be investigated further after you have removed the string algae. Patience is a virtue and it is in your best interest to take a deep breath, add some plants, and a natural water treatment. So you’ve now learned to get rid of the string algae…but the work is not done yet! Here is an outline of what you need to do to continue to control pond algae and keep the water clear in the future while maintaining a natural environment. Please contact us for help if the following tips + Nualgi Ponds does not fix your algae problem. Breaking down some of that excess organic matter is critical to controlling algae long term. Many ponds have from 3 to 24 inches of organic matter resting on the bottom. This organic matter releases excess nutrients as it decomposes and more so if the pond has a shortage of oxygen in its deeper parts. A more radical solution to removing the excessive organic matter is dredging or even draining the pond, cleaning out the bottom and starting over. This can definitely work, but is very expensive. Also, once you clean out the pond, the problems can start all over again unless you take a proactive approach to managing excessive organic matter. Adding aeration and circulation in your pond is the most important thing you can do to help prevent algae long term. Aeration increases the level of dissolved oxygen in the bottom part of the pond which increases the number of aerobic bacteria. These bacteria, in turn, begin to feed on the excess organic matter and reduce the amount of nutrients released. Beneficial bacteria work at decomposing excess organic matter, sticks, leaves, decayed fish and excess nutrients. They don’t have to be combined with aeration, but adding oxygen will significantly increase both their numbers and their level of activity at the bottom of your pond where you need them most. I have string algae, which I scoop out with a rake regularly. But, I have a question about elodia – the underwater plant. I put a few pieces in last year. Now it is filling up the pond. I guess I can take some out. Does it survive the winter? Does it die and add to the gunk on the bottom? It gets tangled up in the string algae, which I thought it was supposed to prevent. Winter survival depends on your climate zone and the inhabitants in your pond. Large Koi, turtles, crayfish, etc. will graze on plant material throughout the winter during warmer periods up north. Excessive plant growth is an indication of high nutrient levels. Manual removal of both the string algae and Elodea helps reduce nutrients in the pond by removing the plants that consumed them. Nualgi will naturally reduce nutrient levels as well as increase oxygen levels creating a more balanced environment. Better balance translates to slower plant and algae growth. 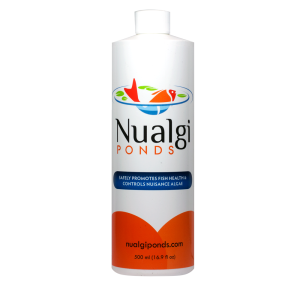 What is the best Beneficial Bacteria to use along with Nualgi? There are so many different ones and a lot of them have other things added to them. Great question Sarah, there are a lot. We recommend Microbe-Lift PBL. Happy Ponding! I have a smallish lotus pond. They like full sun and I have small goldfish and mosquito fish. The problem is the sun is making the water pea green with algae. I’m not sure if moving water will be good for the lotus. But afraid the algae will harm the plants. What else can I put into the pond to help clear this up? Lotus are pond dwellers but also often grow in rivers and broad creeks. Moving water supplies a good source of nutrient rich water that helps promote their growth. Algae competes with nutrients and if dominate in the pond can cause a decline in plant growth. Green water algae limits light penetration necessary for healthy plant growth.String algae can inhibit some plant growth because the plants can get entangled in it. Some forms of algae are toxic and can kill all forms of life in severely degraded ponds but those conditions are highly unlikely to occur in backyard ponds.Use Nualgi…. prevent your worries. Kelly Billing – Water Becomes A Garden. My pond has about 3,000 gallons. I used Nualgi last summer and started early this spring. Just got seven 4-6″ koi and gold fish. String algae growing rapidly. Water clear. How much Nualgi can I put in at a time? Got a bigger pump. Have gold fish added a oxygen plant and iris it also has a waterfall that gets coated with dark green algae I never see fish sucking on the algae on the rocks. Lots of Lilly’s, just can’t get a handle on the dark cloudy water and algae. My water was clear. I added Nualgi to prevent algae to grow. In a couple a days the water turned dark brown, nearly black. Is that normal when you treat the pond with Nualgae. Its not normal. We have seen this in a few cases. It is generally a part of the process where new biology is taking hold of your pond. Please email us a picture of your pond water in a clear glass container against a white background. anil@nualgiponds.com. Allow the process to continue. It would not be a bad idea to add Microbelift PBL along with Nualgi. We don’t get string algae in our pond just in our bog. This time it looked like netting instead of string. Any suggestions? All plant matter consumes Nitrogen and Phosphorus to survive. Some have very little storage (single cell green algae) and others can survive a long time without nutrients. Your netting type algae is probably a little hardier than single cell algae but it too will starve in due course. If you like, you can dose an extra dose each week in the bog to speed up the process. Hi There. I enjoyed the above article. Our pond is approx. 1\4 acre in size and we are starting to get a lot of string algae now that the temps have gotten into thelow 90’s. We have an aerating fountain. Is it reasonable to try your product in a pond that size? What is a weed eradicator? Nualgi will get rid of string algae over time.